Our home is a 2003 Lance 1121 truck camper. So it rides completely supported by a pickup truck, with no wheels of its own, unlike a trailer. These units are typically measured by floor length; an 8' camper will fit within the bed of a full-size pickup. Ours is 11' 6", so yes, it sticks out the back a fair bit. This is nearly as large as truck campers get, but in the world of RVs, our "rig" (as they say) is maybe medium-sized, and most folks who live in an RV full-time would consider it tiny. All told, our 2-part RV is about 24' long (plus the bikes on the back), 8' wide, and 11' tall. It tips the scales in the neighborhood of 14,000 pounds. Still, as Teresa has said, there are times that it feels like living in a shoebox. 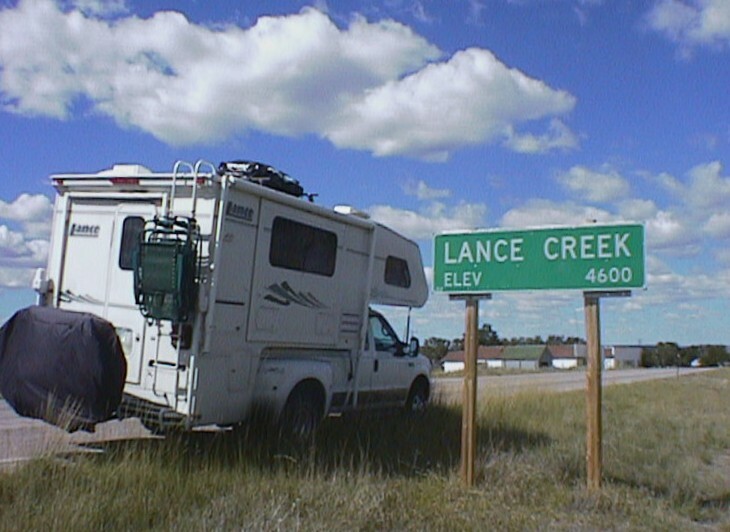 One of the major reasons that we selected a truck camper for our travels is that it can be detached from the truck. [The other reason is that it has some semblance of all-terrain capability, but that's to be covered elsewhere.] Most full-time RVers accomplish the same thing by towing: either they tow a car behind a motorhome, or they live in a trailer pulled behind a large truck. But we thought the driving experience would be better if we weren't towing, and a truck camper is really the only way I know of to separate a vehicle from your living space without towing something. Here's how it works: The camper is held to the truck by 4 big steel tie-downs. The camper also has extendable legs of its own, in our case operated by RF wireless remote control (very cool). So you simply undo the tie-downs, extend the legs, and drive the truck out from underneath. Sounds simple, right? It's actually quite a frightening experience, mostly because the camper is really heavy and the legs are, well, wobbly. Imagine a 2½-ton box (say, a 1992 Isuzu Rodeo) balanced 4 feet off the ground on movable legs less than 2 inches wide. Just so you're nice and relaxed about the whole enterprise, put as many of your worldly possessions in the box as will fit. Then spend some time maneuvering the largest pickup truck Ford makes underneath it, backwards, making sure you have it aligned to within a fraction of an inch but without touching it. And for extra fun, give the Ford a heavy clutch, a sloppy transmission, and vague steering. Beginning to get the picture? It's so hair-raising that we've actually only done it once in the 6 weeks we've owned the camper. Hopefully we'll become more accustomed to it, because our lifestyle would certainly benefit from easy detachability. We'll see. Note that in the previous photo to the right, the camper is in its "down" position on the jacks, as opposed to the "up" position required for loading onto the truck. On the far side of the camper, you can also see some of the utility connections at this park; more about the utilities later. And, you get a nice view of the slide-out room, a concept that's been around for a while on larger RVs but is apparently a fairly recent arrival to the world of truck campers. We're always getting comments from people saying they've not seen one before. Basically, it's a section of one wall that moves outward by means of an electric motor which drives a track on the bottom of the slide. 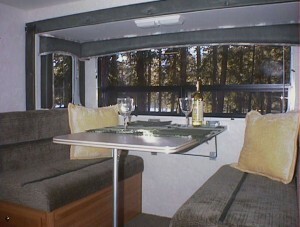 Ours moves out about 20" and contains our dinette. 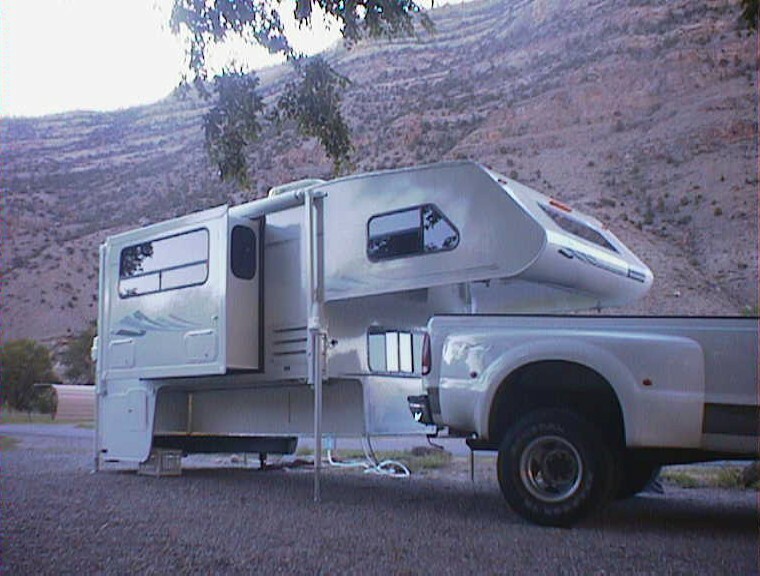 While the camper is usable with the slide in its "in" position, moving it out makes a world of difference, and it's usually one of the first things we do when arriving anywhere. We have a 40 gallon fresh water tank that will last the two of us for 4-5 days, given some conservation. Showers aren't exactly luxurious (or exactly daily) when doing so, but we do all right. There's a small pump that pressurizes our onboard water system, more or less. We filter all water coming into our tank, mostly for sediment and taste - microbiological filters aren't very practical at this level. And we have a "city water" connection, so when we're in a campground with water hookups, we can bypass our tank & pump and get water directly from the municipal supply. Other than the flaky pump, we're gradually coming to grips with the water system. Camper sewage is euphemistically divided into "gray water" (from the sinks & shower) and "black water" (from the toilet), and these are typically kept in separate holding tanks. In our case, they're 25 gallons each, enough to hold our entire fresh water supply after it goes down the drain, plus a bit extra (what I call "the beer factor"). So every 4-5 days we need to take the camper to a dump station and empty the tanks. I won't belabor the details; suffice it to say that while dumping the tanks isn't the most pleasant aspect of RV ownership, it isn't generally as bad as you'd expect handling raw sewage might be. The electric system deserves an article of its own. But in a nutshell: For mostly historical reasons, RVs have 2 complete electrical systems, 120VAC (like in a house) and 12VDC (like in a car). We have a 105AH battery, an onboard charger, a generator, two DC-AC inverters, a connection to the truck's electrical system, and more wiring than you'd like to think about. We're planning to add solar panels, an amp-hour meter, and yet another inverter. And yes, electricity (or the lack thereof) is one of our biggest ongoing headaches. Our furnace, stove, generator, water heater, and sometimes our fridge run from propane. We have two 7-gallon removable tanks with an automatic changeover, so that when one runs dry we use the other until we get the first refilled. And contrary to what we've heard, we don't use much propane - so far, we only find ourselves needing to fill one of the tanks about every 2½-3 weeks in warm weather, or about once a week when it's cold. Other than occasional difficulties lighting the stove, the propane system is a model of reliability and trouble-free use. Our phone is primarily cellular; we carry a tri-mode Motorola StarTac 7868W. But we're frequently far enough from any cell towers that it just sits turned off in a drawer. We're working on getting an Internet phone service (just one of the consumer ones, can't justify a dedicated VoIP system), but haven't gotten one to work consistently yet. And believe it or not, the camper is prewired for telephone as well, apparently for the occasional RV park that really has full hookups. Internet connectivity also merits its own article. Once again, here's a summary: Our full-time RVing adventure depends on me working, and my computer work is dependent on a 'net connection. 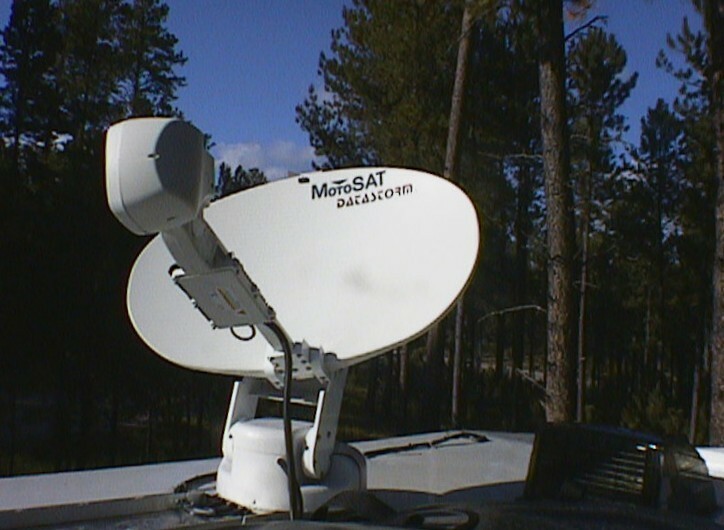 But the only way to actually get connectivity nearly anywhere is by satellite, and the only real option for doing that is with a MotoSAT DataStorm dish and the HughesNet service. So that's what we've done. Neither Teresa nor I are TV addicts, so we have no television in the camper as yet. But if/when we decide to add it, the obvious way is to add a second receiver onto our existing satellite dish. We'd then get a USB tuner that would effectively, temporarily, turn one of the laptop computers into a TV - meaning we'd need very little additional hardware. But for now, we've realized that we're happier without it.